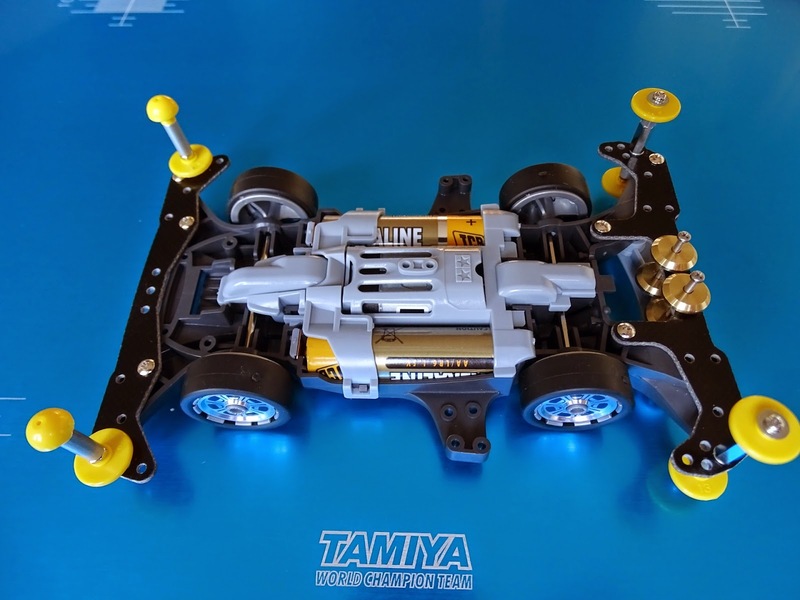 A popular line of Tamiya products that we do not really see over here are the Mini 4WD series. 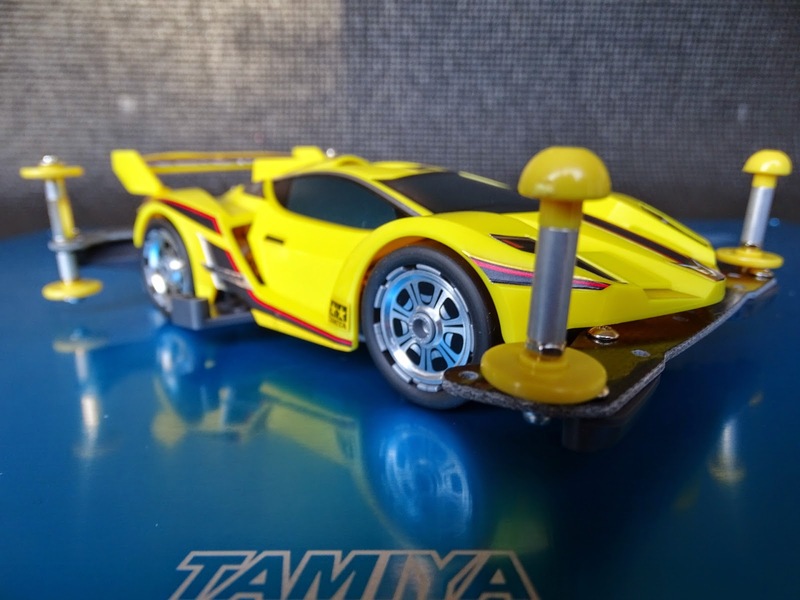 In Japan the class has become very popular, racers young and old take part in modifying these apparently simple battery operated cars to reach some incredible speeds of over 40 mph! 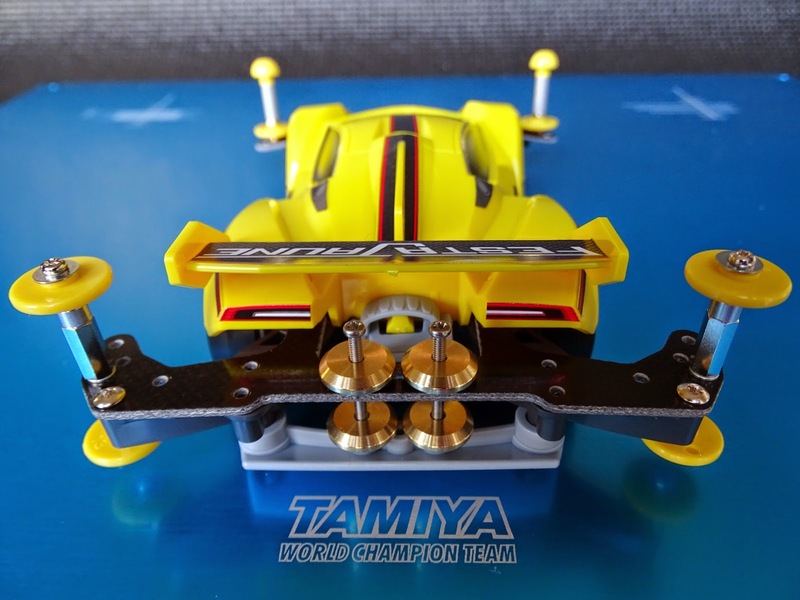 When I was last in Tokyo there was a fantastic track set up in a local shopping centre, naturally after seeing a Tamiya logo I took a closer look and I was hooked on watching these little cars wall ride, jump and race each other. At the time I didn't purchase one, but a friend recently sent me one over with a few hop-ups, so lets take a closer look. 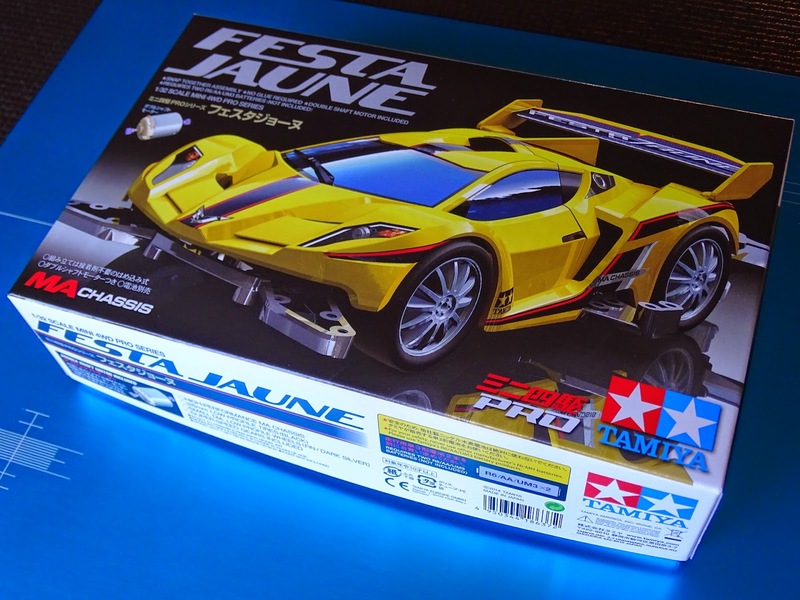 Tamiya started making these cars in 1982. 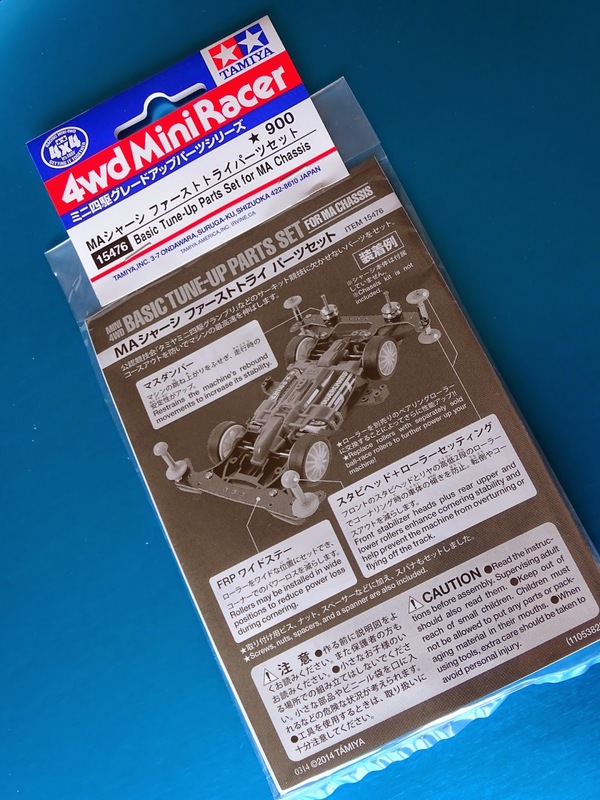 They were 1/32 scale cars with full shaft driven 4WD running off 2 AA batteries. Initially they were just battery operated version's of some of their buggies. 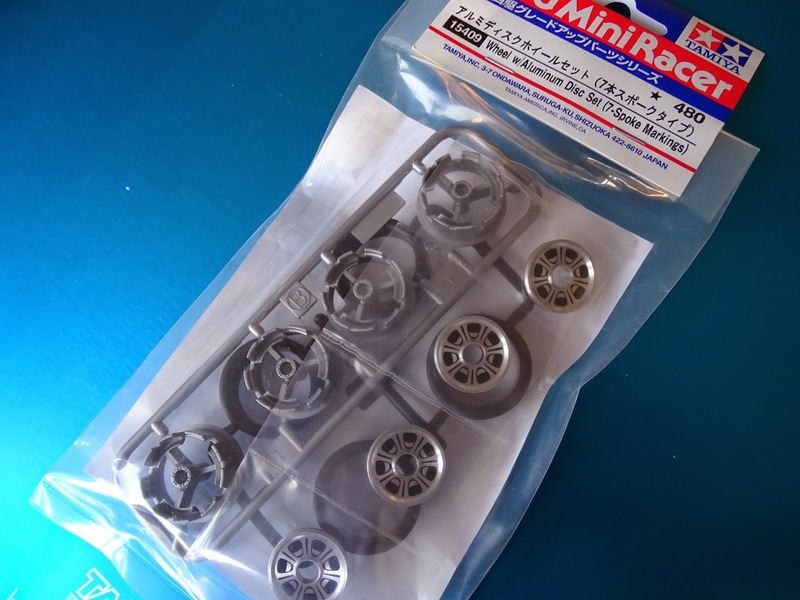 Soon Tamiya cottoned on to the idea that people could race them, so they made onroad versions and created plastic tracks that the cars can run around. 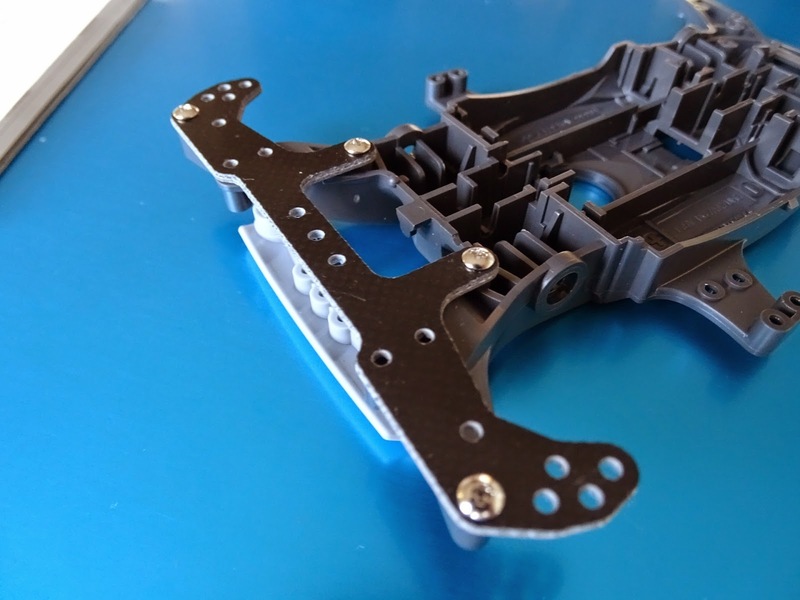 There have been over 10 chassis types released, they primarily feature different motor and battery positions but the later MS and MA chassis even have double shaft motors providing direct drive. The cars have rollers at the front and rear, these allow them to move around corners on the tracks, you can fit different size rollers to make the car more or less stable when entering a corner, the trade off is as always speed. 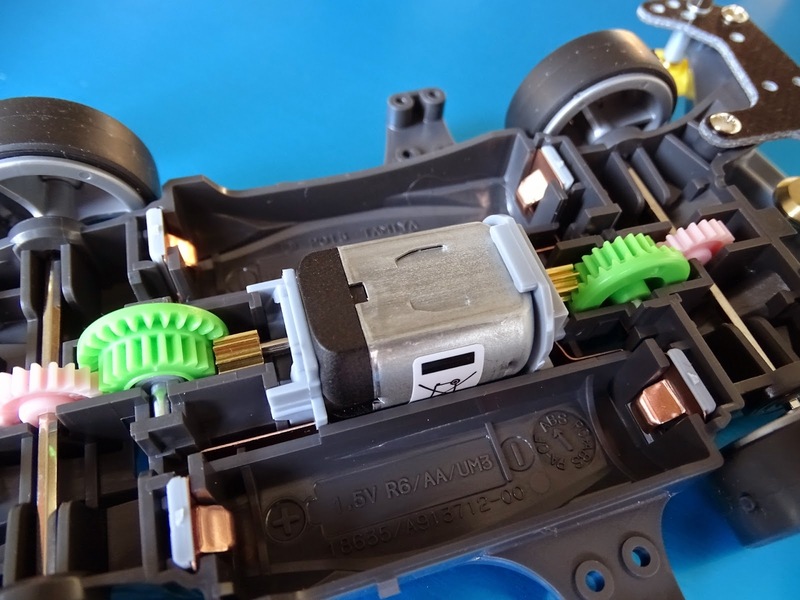 The gearing is fixed in the kit and related to the actual model of car (Not chassis) but they can be changed on the cars by buying different motors and gear sets. Lastly the bodies are usually hard plastic, although you can get polycarbonate ones as well. 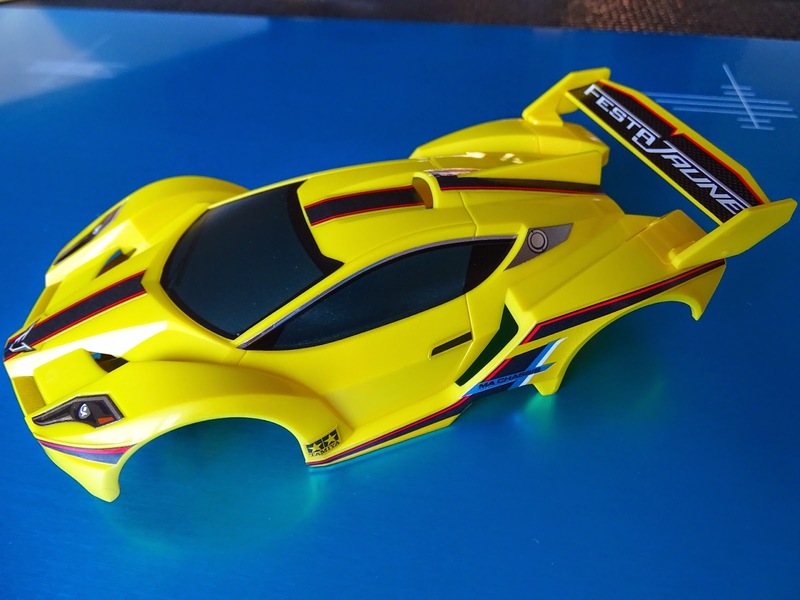 There are loads of fantastic anime styled bodied cars out there, and the design of them is fantastic. Check this video for an event similar to the one I watched. So lets start the build. 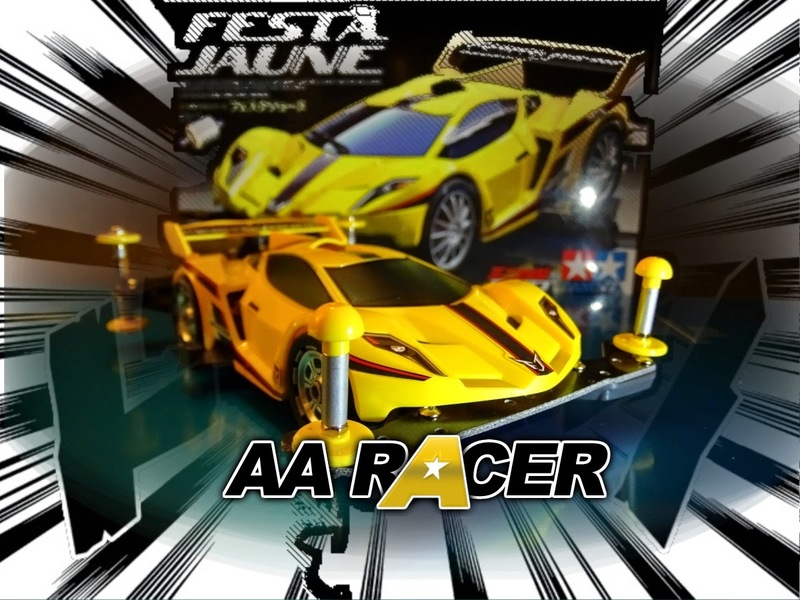 The Festa Jaune is a striking looking shell housed on top of the MA chassis. 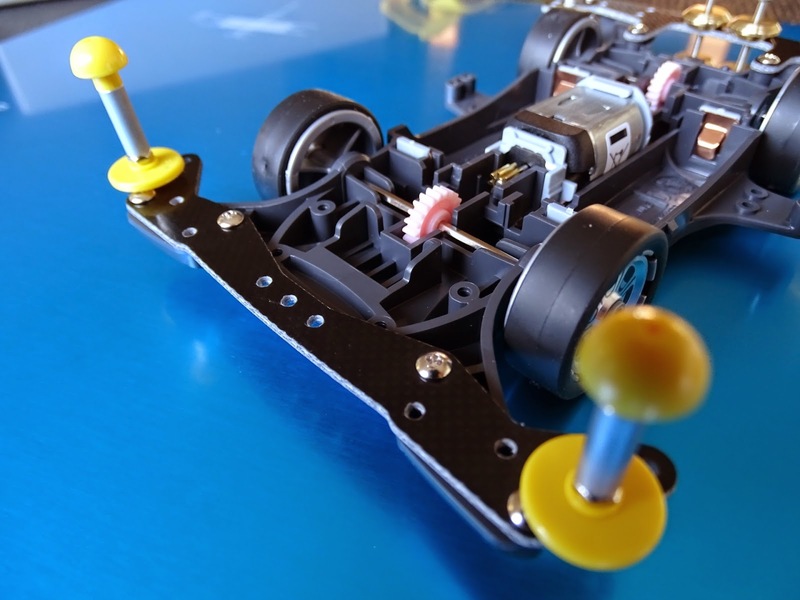 The MA chassis is the most recent Mini 4WD chassis design, it takes a lot of the earlier Tamiya MS chassis features including the distinctive dual shaft motors. The chassis is aerodynamically designed for better channelled airflow and a lower centre of gravity, it even has a rear diffuser that works as a skid plate! First up we need to do the body shell. 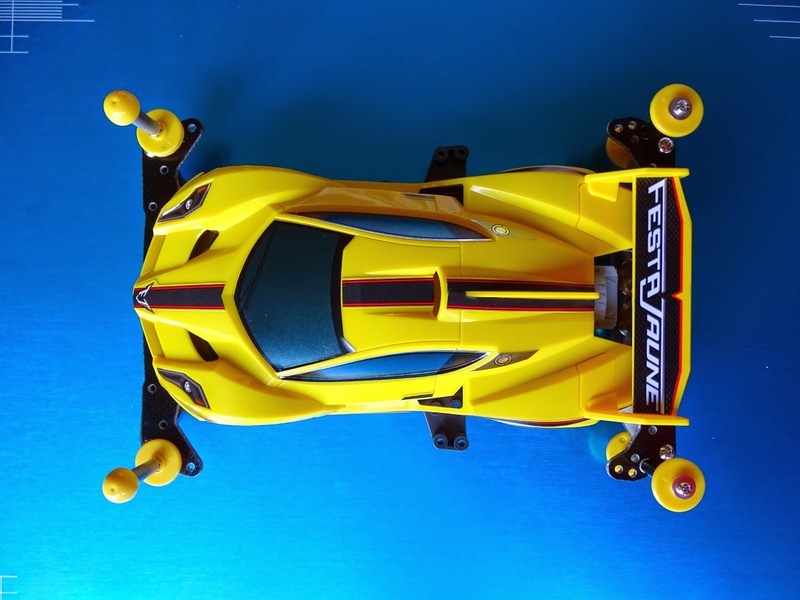 As expected from the leading model maker in the world, the quality of the body is fantastic. There is a lot of little detail on the shell, and when you add the metalic stickers the final result looks very close to the box art. Now we need to fit the skid guard to the underside of the chassis, as you can see the claims that it has been aerodynamically styled look to be true, with the smooth underside and the air channels leading to the diffuser / skid guard. Now it would be time to normally do the kit rollers, but I have the following tune up set (Part no 15476) for the MA chassis. First I add the hop-up FRP rear Stay. These are considered a hop up as they give extra strength to the car when hitting a corner. As you can see it has a lot of holes to attach different rollers and mass dampers (Weights) to the chassis to tune the handling of the car. I then build up the upper rollers, they use a spacer to help balance the car when it hits a corner, it has 13mm rollers on the top. 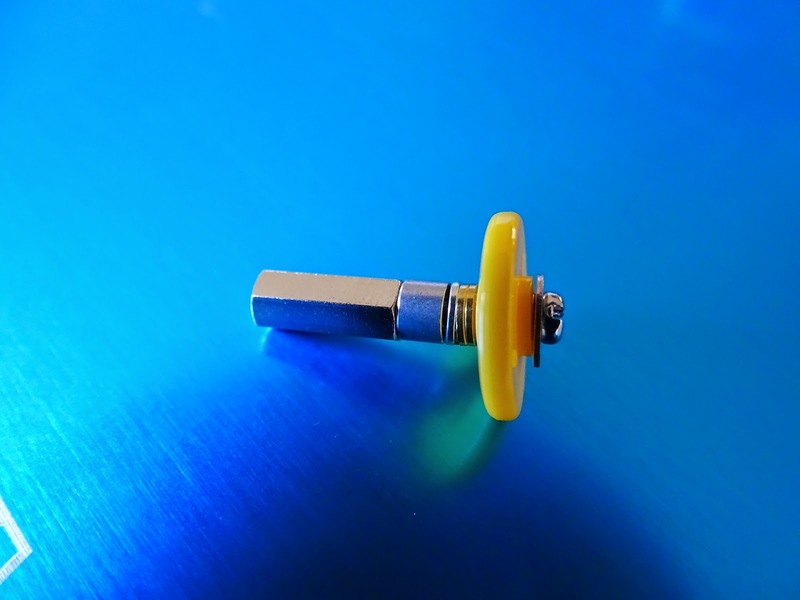 The lower 13mm roller are next and these also spin freely, and then you assemble them on the rear outer holes on the rear stay. 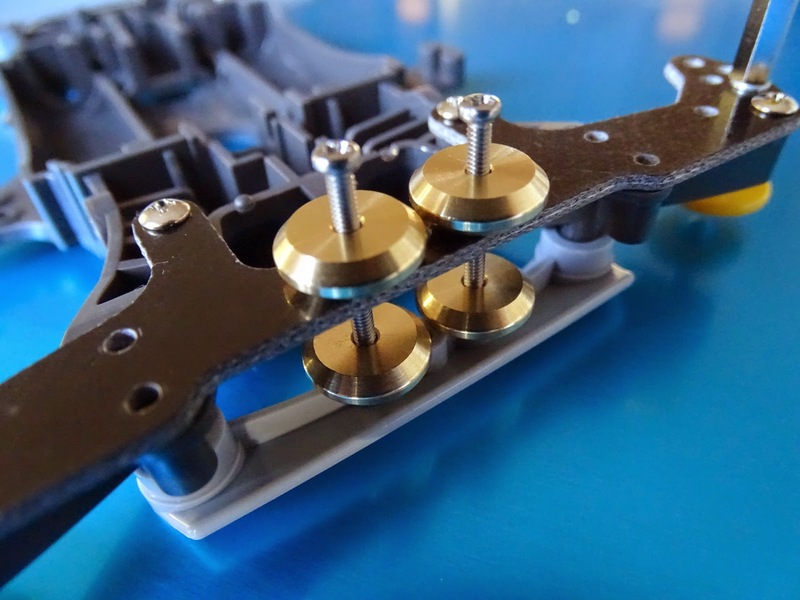 It's time for the mass dampers now, these are basically brass weights that can help the car be more stable in different situations especially when jumping. I fitted these in the middle of the damper stay, as you can see they will move around. 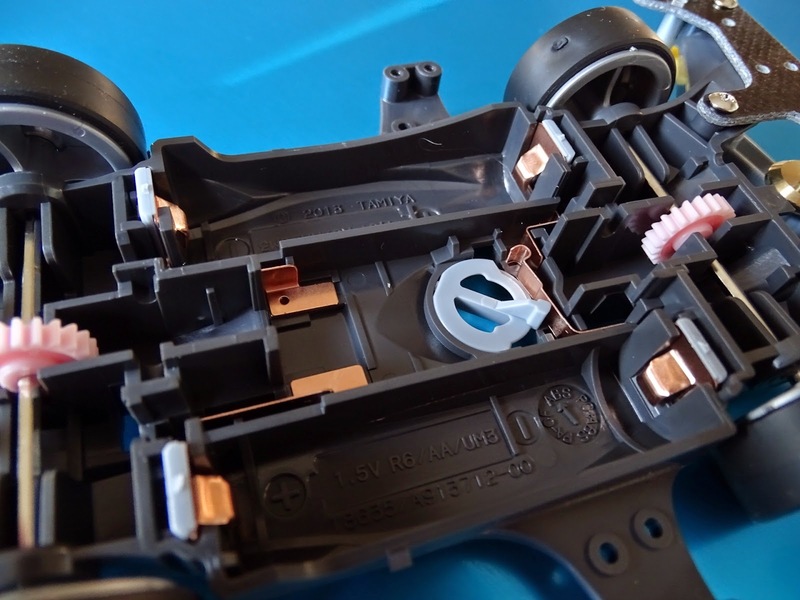 This movement is intentional as it is supposed to absorb the force when the car bounces, the movement off the weights will dissipate the kinetic energy. Now it's time to fit the wheels and wheel axles. 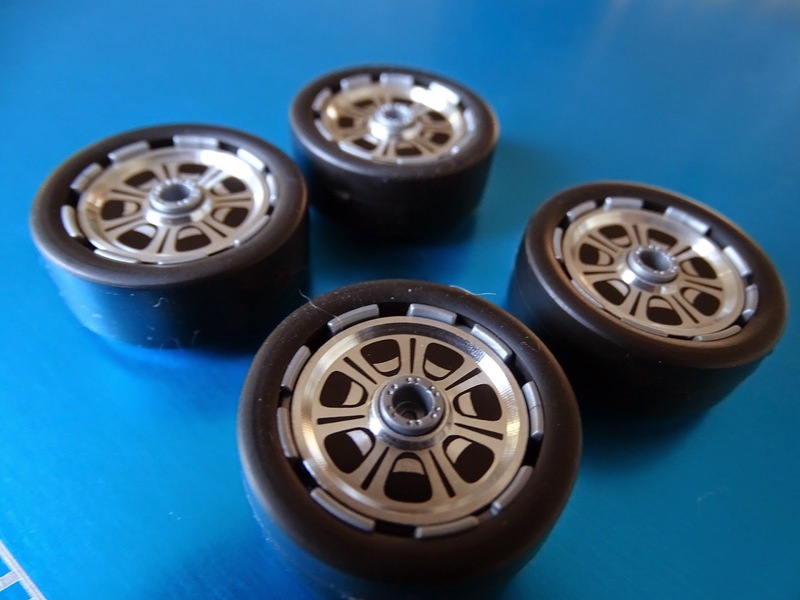 In my packet I also had these hop-up blingy aluminium wheels. These are not just for looks, they are also stronger and less likely to crack when landing from jumps, they will also not flex as much, allowing the tyres to work harder on the track surface. 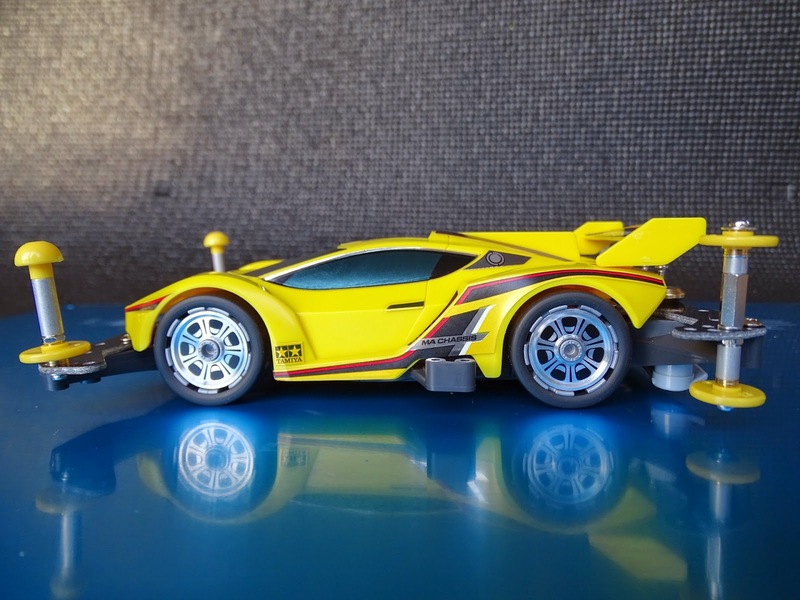 The wheels just clip into a plastic frame, and they look great, the detail for the inner and outer rim really make the wheels look smart. I then squeezed the wheels onto the axle and through the Hex Hole Ball bearing set (Part no 15287), the kit has plastic bearings and grease, but I had the hop-up bearings to fit into the car. As you can see, you also have to fit on the pink drive gears. The car runs so freely, it actually moves if I blow on it. The circular switch then clips in, ready to fit the motor on top. 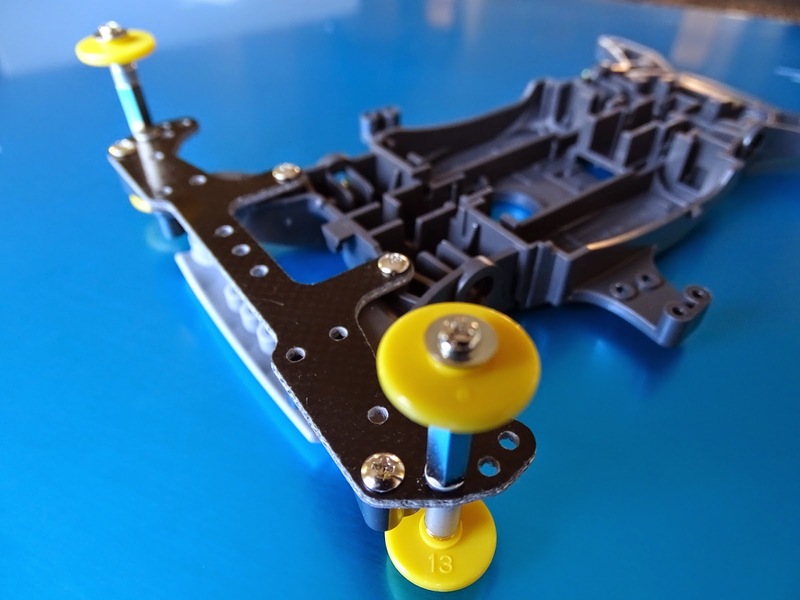 The MA Chassis has a dual shaft motor that fits in the middle of the chassis to provide drive to two idler gears that lead on to the pink drive pulleys. 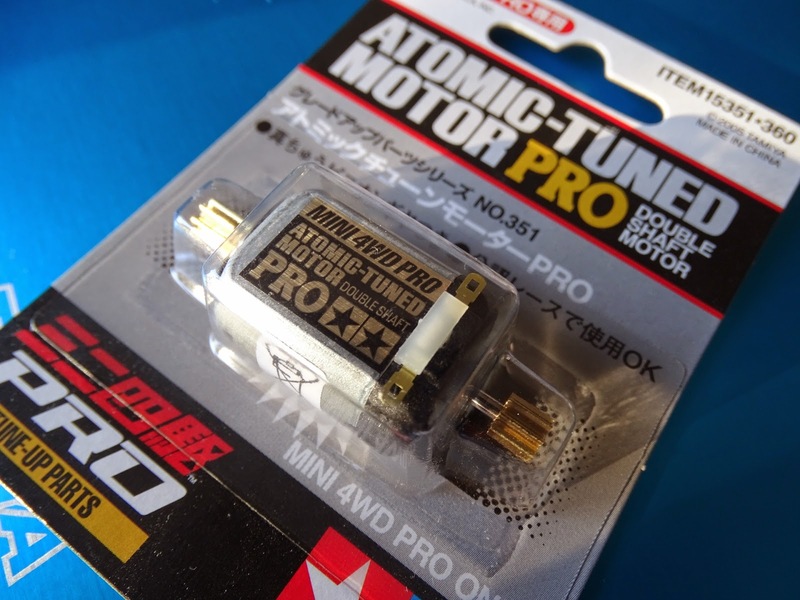 I did not use the kit one, but instead had the rather coolly named 'Atomic Tuned' motor to install into the chassis. 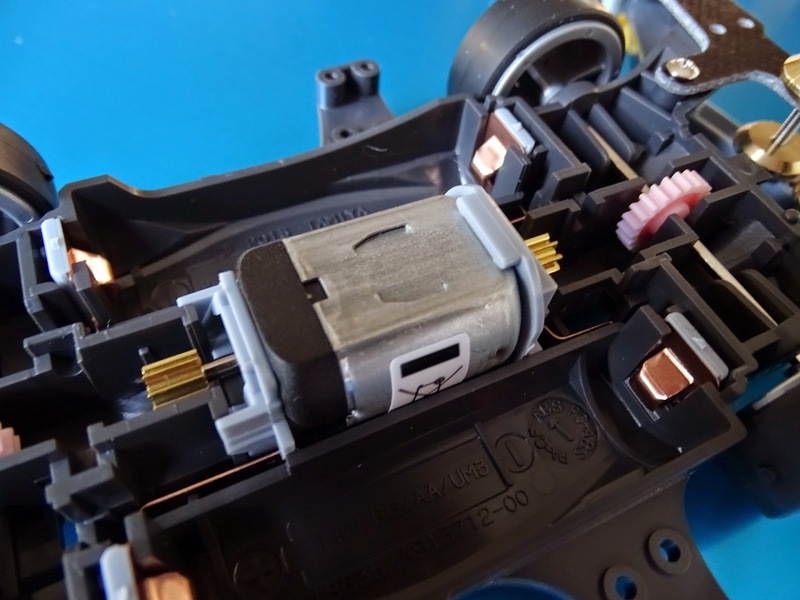 You have some mounts that you fit onto each end of the motor, and then you simply click it into the chassis. Now it's time to fit the front Stay and rollers onto the chassis. 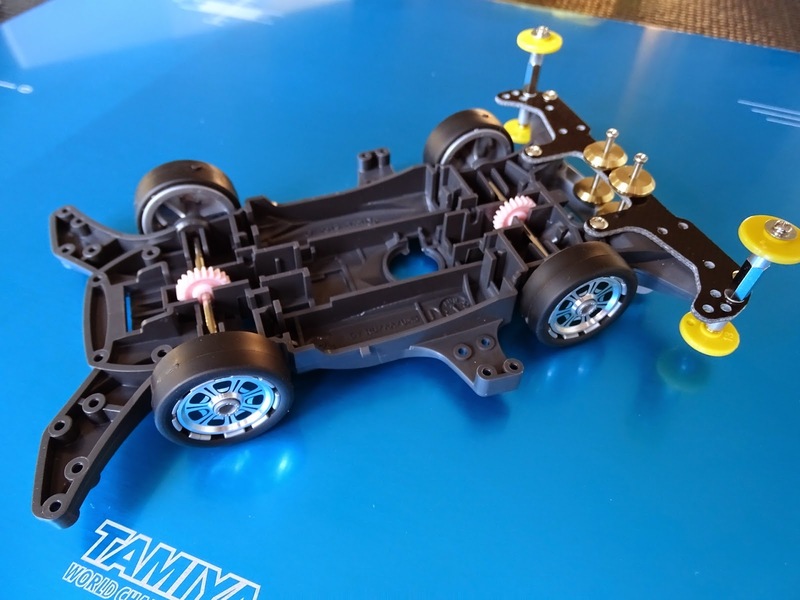 Again I am using parts from the MA chassis tune up set so first I had to install the FRP stay, and build the rollers. As you can see the front only has one pair of rollers, and those strange domes at the top of the shafts are Stabiliser ball caps. 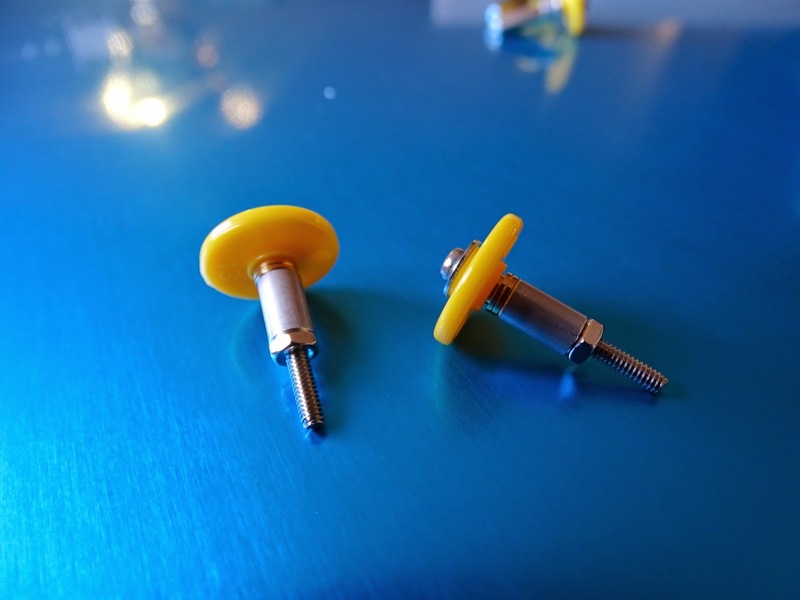 These are there to help the car when cornering on the circuits as the poles will touch the fence as the car tilts and will help prevent it from flipping over. The final part of the drive train is added now, these little green idle gears fit on some plastic bearings (Although you can buy proper ball races to replace these). Now the final parts are added, the top part of the chassis that holds the gears and motors snugly together, and the battery holders. Now we just have to clip on the body and here are the final results. As you can see it looks great! Race car, looking for a track! The main issue is that these cars just drive in a straight line unless you have a special track. I tried to make a basic track by using some card strips and I managed to make a large U-shape corner. So the car would charge into it and wheel around before launching itself back at me, as I dived to catch it with a cushion. 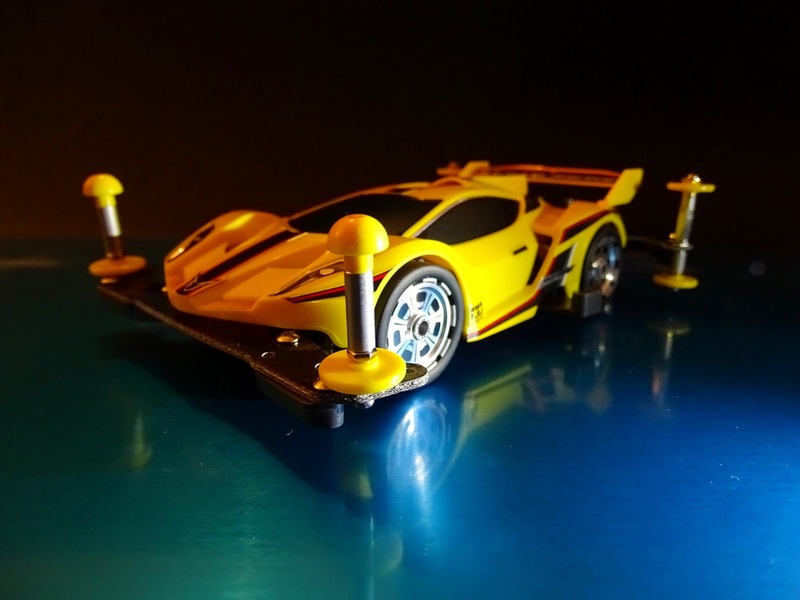 I then made a little ramp from some card and the car took the jumps pretty well, the car was getting some good air, and despite it not always hitting the ramp straight on, it landed on it's wheels most times. I noticed how the weights (Mass dampers) at the rear worked well as the car didn't dip forward when in the air, and the car settled quickly once it landed, especially as there was no proper suspension to speak off. I really enjoyed the build, and diving around my living room catching a little yellow bullet was fun for a while. However I'm missing the real fun off racing these cars with others on a proper track. I took a look around on the net and the only tracks I found had to be imported and when you factor in the shipping costs even a basic track is very expensive.